You can use Front Matter with your content, define variables and metadata next to your markdown-based content - just like in Jekyll. Define your own content tags, that can be used in the markdown content source, along with several other, pre-defined ones, like code blocks or gist embeds. Using included partials, I could create reusable components for the site, that can be fed with the necessary data. Besides a handful of helper functions, you can write your own helpers. They access all the relevant data needed, either from the content, or the configuration. The documentation of Hexo, however, is not the best, took a while to figure out where to put these plugins. helpers are to be used in templates, partials, and layouts. Hexo uses a JSON based data store called Warehouse, which has a MongoDB-ish API syntax. All the posts, categories, tags and content-relevant meta can be queried, ordered and filtered through this API. Using plugins like hexo-renderer-scss enables your site to use SASS and sass files, functions and mixins - with zero configuration. If you’re interested, check the source of this site on GitHub. I’ve mentioned, that I wish to move away from GitHub pages, and luckily Sara Soueidan migrated her site recently. She picked Netlify as a static site host - so following her footsteps, I took a glance at it. Your site appears under a random netlify URL, where you can preview it and you can review your deployment logs on their dashboard. After adding your custom domain, they can set up free https using LetsEncrypt - and all this free for personal projects. They’re really easy to use, definitely worth checking out! Later on, you can use this random url feature to preview your posts, before publishing them to production. You can set your custom ENV variables, so your secrets are not exposed! For example the access_token for the Instagram API is passed to the Hexo build task in the INSTAGRAM_TOKEN environment variable, so I don’t have to expose it in the source code. After the basics were settled, some ideas popped into my mind to make this blog maybe a bit better. Twitter and Facebook can render a picture next to your shared post if you set your meta tags right. These settings are well documented for Twitter and Facebook too. But creating these images for every post can be tedious, so I’ve tried to automate them. It turned out, I can render these from SVG using various tools, for example, a headless browser! I’ve created a template SVG with the background and the logo, and a placeholder for the text content, the title, date and estimated reading time. (Found this useful, posting the read time on social media, it may help to decide when to read the post). It is possible to add text to SVG’s using HTML, and style it with CSS. I’ve created a foreignObject tag inside the SVG, where I can put text from Nodejs using cheerio. Next step is to render this SVG to png with an SVG renderer that can handle foreignObject tags, in this case, a headless Chrome. The convert-svg-to-png library conveniently wraps this into a simple async function call, after which I can save the resulting Buffer as an image. I wished to share some sights from the places I’ve been and talked, and I usually post these photos on Instagram. Unfortunately, the Instagram API documentation wasn’t too friendly on how to access their API, especially when it came to authentication. But this small tool by the Pixel Union is an easy way to get an access token, that can be used during deployment and site generation, to fetch the images for the gallery. Under the hood, you authorize their web app, to access your photos, and they give you the access token they would use. 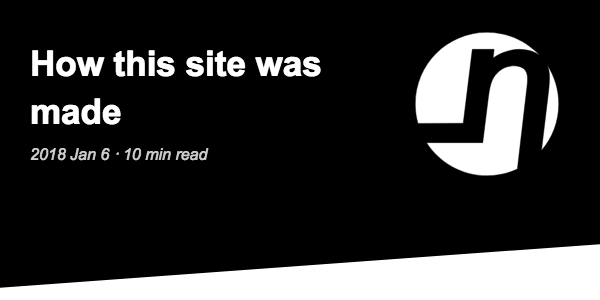 Do not forget that this happens at site generation, not site visit, so it’s pretty neat. I love this feature on Medium and found a node lib called ‘reading-time’ that calculates exactly this data - or at least a near estimate. Pass it the content of a post and it will return the time it calculated, all at site generation time during deployment. To be honest, I do not wish to hassle with comments on this site. All the content source is available on GitHub, where one can fork and suggest an edit, or just find me and ask questions. It was easy to create the exact GitHub URL for each post, using their source filenames, like the one for this post and add them automatically to the bottom of each post. Posted on 2018, January 6th , tagged as hexo, learning, netlify, tutorial .